The box that the keyboard came in was the regular white with pictures type of box that Apple products generally come in and there wasn't really anything to complain about there, if I were one of those who constantly feel the need to find problems with things I'd say that I was a bit disappointed that the pictures on the box didn't match the orientation of the keyboard in the box (picture of the end of the keyboard on top of the box), but I assume this was done to showcase how thin the keyboard is. And boy is it thin, compared to my old transparent keyboard with white keys this thing is super thin, and the width of the keyboard really adds to this because as you might have noticed in the picture, it doesn't have a numpad. The lack of a numpad doesn't really bother me as much as the lack of PgUp, PgDown, Delete and End which are all keys I use quite frequently when programming. 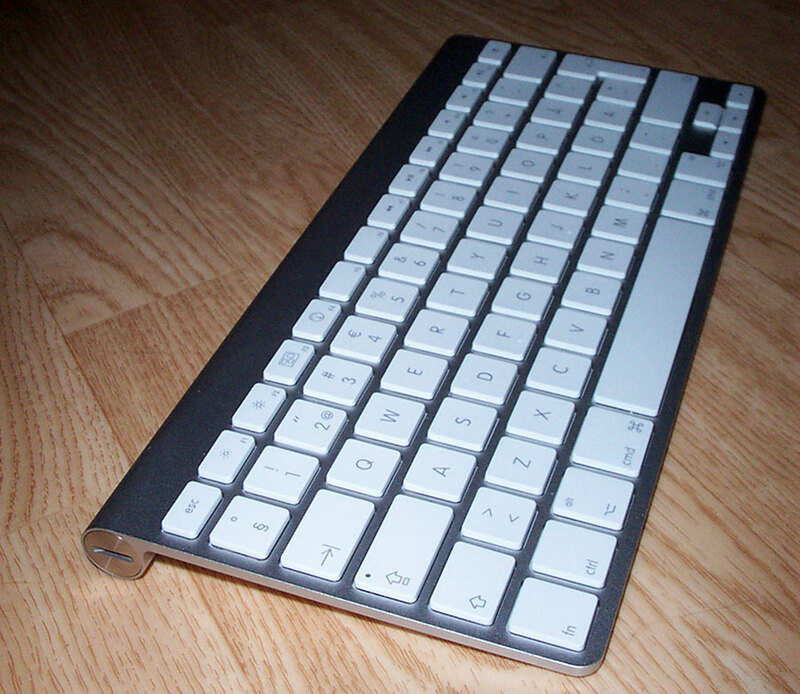 Overall the keyboard looks impressive and dare I say, "futuristic"? I suppose I shouldn't use that term since it will come back to bite me in a couple of years. At this point it was time to connect the keyboard to my computer and take it for a spin. Connecting the keyboard was a breeze, just pop in the batteries, press the power button and it shows up when searching for new USB devices. after pairing the keyboard and the computer I ran software update and got the keyboard update to enable the Expos� and iTunes keys. At this point I ran into a bit of an annoyance, I had to restart my computer for the update to finish. With the update done I went on to take the keyboard for a test-drive with some light coding. My first impression was that the laptop-like keys of the keyboard were almost a little too easy to press but after ten minutes or so I was convinced of the superiority of laptop keyboards over regular keyboards, just lightly tap a key to press it. So for those of you who hate laptop keyboards regardless of how good they are, steer clear of this keyboard as it essentially feels like a really good laptop keyboard. In conclusion, if it didn't sport a hefty 695:- price tag I would probably buy a few more of these for the rest of my machines, I love it. I also wish the keyboards at work were this good.